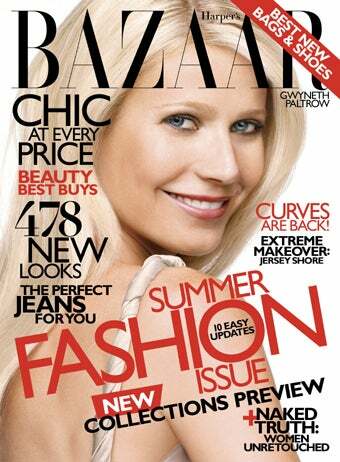 The May issue of Harper's Bazaar has Gwyneth Paltrow on the cover, but tucked inside are the images — photographed by Danielle Levitt — in which Jersey Shore's Sammi, JWoww and Snooki get fancified. Gweed looks like a lady! Back in March, Snooki posted images on Twitter with a blackboard in the background; so we knew there would be some kind of teaching theme. The magazine featured ladies from The Simpsons in July of 2007. In July 2009, an interesting role-reversal shoot depicting a working mom and stay-at-home dad starred Milla Jovovich and Chris "Mr. Big" Noth. This year's March issue featured fashion spreads inspired by Bonnie And Clyde and the films of Pedro Almodovar. While some other ladymags might offer the same old, same old, Bazaar continues to surprise. Who knew Snooki, JWoww and Sammi could look like haughty heiresses? Which Simpson Wore It Best?